Andy McIndoe's Designer's Diary: @The_RHS Chelsea 2013 – Team Briefing 2 – Only a week to go! @The_RHS Chelsea 2013 – Team Briefing 2 – Only a week to go! This is the second instalment of my briefing for Team Hillier at Chelsea 2013. It’s now just one week until we start work on site, and just over two weeks until the show opens. The warmer weather and sunshine has brought the plants on from where they were, but there is still a long way to go. This transition from cold and dull to bright, warm and sunny does bring its challenges. Tender new leaves do not have time to build up resistance so it’s a challenge for Ricky to protect them from scorch, to keep them watered and move things into the cold store as they bloom. After such a long slog to get the flowering subjects to perform we do not want to lose any because they have gone past their best. Anyway it’s about time to tell you a little about how it all happens. On Thursday 9th May we’ll be loading up any construction materials that we are taking with us along with tools and equipment. Nigel Roman takes care of this and he’s a key member of the Chelsea team from day one to the last day of build-up. Nigel originally worked for Hillier Landscapes, but today has his own landscape business. I’m delighted to say that he still comes back for Chelsea. Then on the Friday morning the Hillier build team head for London in time to meet that lorry that was loaded the day before. Perhaps the most essential bit of kit that goes with us is our fork lift which will work very hard over the next few days. This is driven by Neil Robins. Neil is section head on Brentry container production unit. He’s been part of the Chelsea team for over twenty years and as far as I’m concerned he’s in charge of operations; site foreman. He is also responsible for Health and Safety, vehicle movements, unloading, loading and generally how we work on site. Neil is a remarkable fork lift driver and his skills are put to the test from Friday morning when the construction materials start to be delivered to site. These include: sand, ballast, 600 building blocks, paving, buildings, timber edging, pots, sculptures, buildings and so on. Then there are our two landscape construction specialists Steve Richmond and his son Luke Richmond and myself. Steve and Luke lay the paving for the main walkway through the exhibit, the bases for the buildings, water features and sculptures. They use a constant supply of mortar mixed for them by Nigel and his trusty mixer. Mr Mix will make 100+ mixes during the build and will use 16 tones of sand, 100 bags of cement and 2 tons of ballast. Brian from organicstone will join us on site with his delivery of amazing paving to create the walkway and feature paved areas within the Hillier Garden. Brian never leaves anything to chance and I know he will have put an incredible amount of thought and preparation to make it as easy as possible for my landscaping crew. Before we can start on construction we cover the whole site with black polythene sheeting and mark out my plan on the ground. Adjustments to the positions of features invariably have to be made due to unforeseen obstacles, like the supports of the pavilion or water or drainage pipes. This year we have taken the decision to deliver in the biggest of the trees on Friday. This is a day earlier than recent years but Neil rightly points out that it will be easier to get them into place before we surround them with paving that we can’t drive the forklift over. This type of logistic decision is Neil’s speciality. The team then have the rest of Friday, Saturday, Sunday and Monday to do as much of the hard landscaping as possible. The first of the plants, more trees and the big shrubs arrive on Tuesday so things start to get a little more crowded. In addition to our build team we will have help from M&M Timber – They arrive on Saturday 11th May to construct the deck, build the Sydney Sunroom, the outdoor living space, and install the timber edging. Suigeneris arrive on Monday to deliver the Camber seating and install the Corona water features, all made from fibreglass. I’m looking forward to seeing these – they look amazing but what will they look like at Chelsea? Next time: the staging team. For some of you that means you. 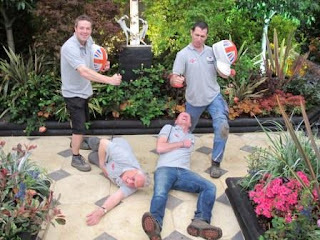 I’ll tell you what to expect from a normal day at Chelsea Flower Show. What am I talking about?...........normal is not really the right word!